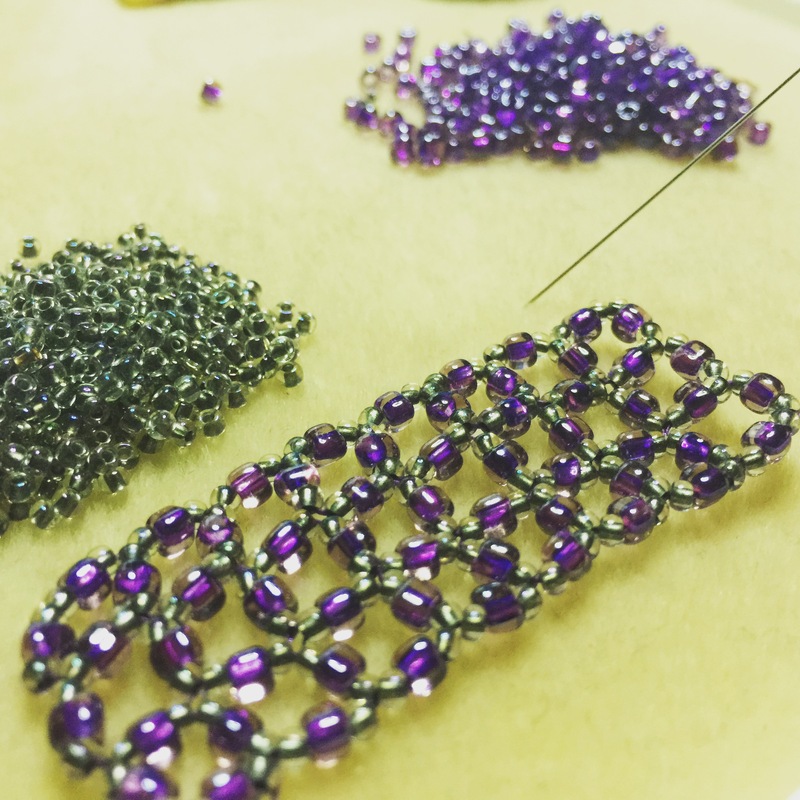 As someone who is interested in history, and more specifically historical aspects of beading and other ‘women’s work’ I am always fascinated to learn about different culture’s practices with regards to beads and embelishments. One of the cultures who have had a huge impact on beading and bead embroidery, is the Native Americans. 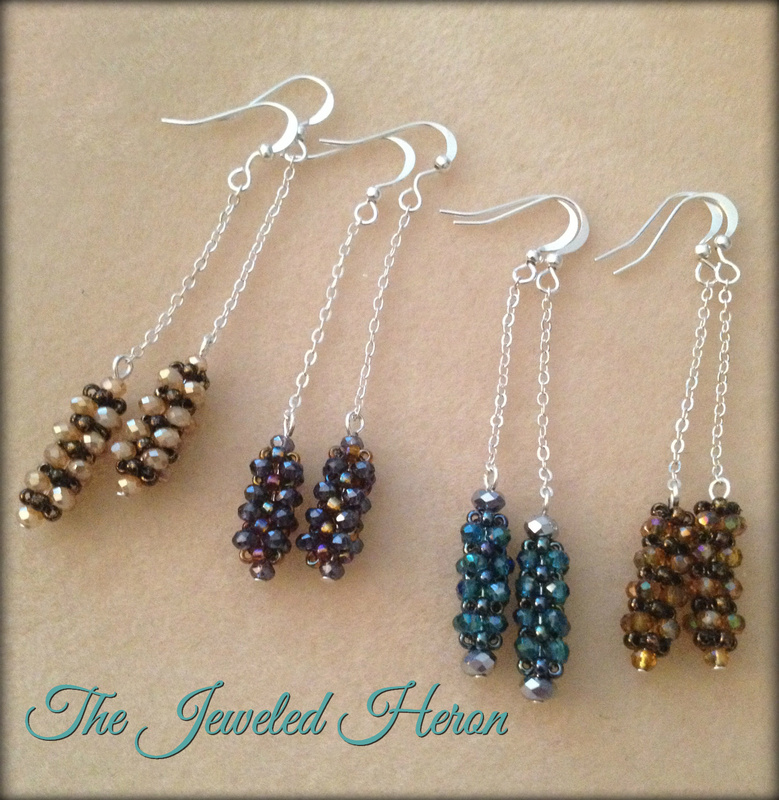 They have made some of the most beautiful beaded pieces and continue to do so! 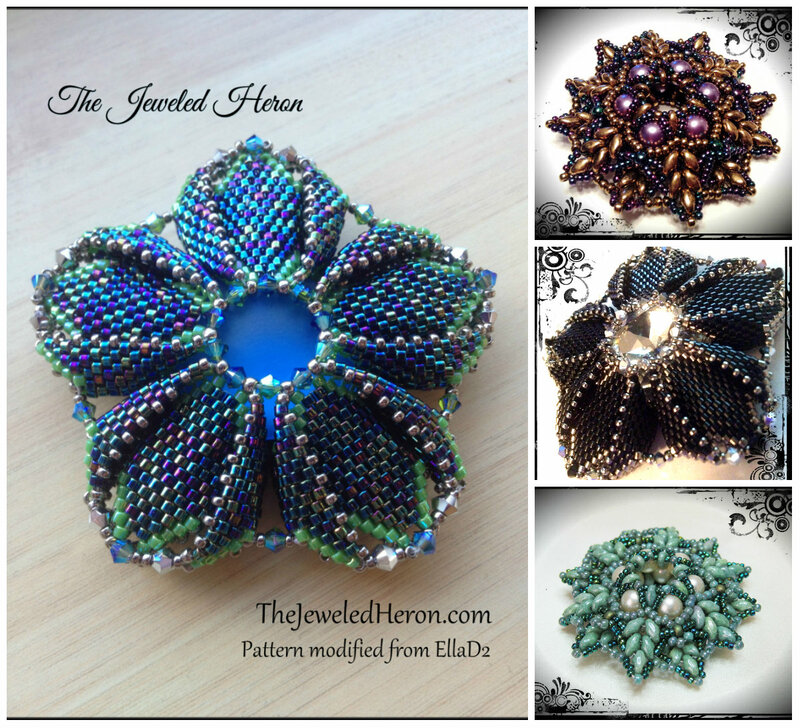 Their work with seed beads is intricate and colorful, and their applique process is intense! The symbols they use are distinct to each tribe and their beadwork usually holds a spiritual significance which expertly flows through the entire piece. I love it when artists work spiritual aspects into their pieces. It’s something I try to do myself in many of my works. Sometimes with more success than others. 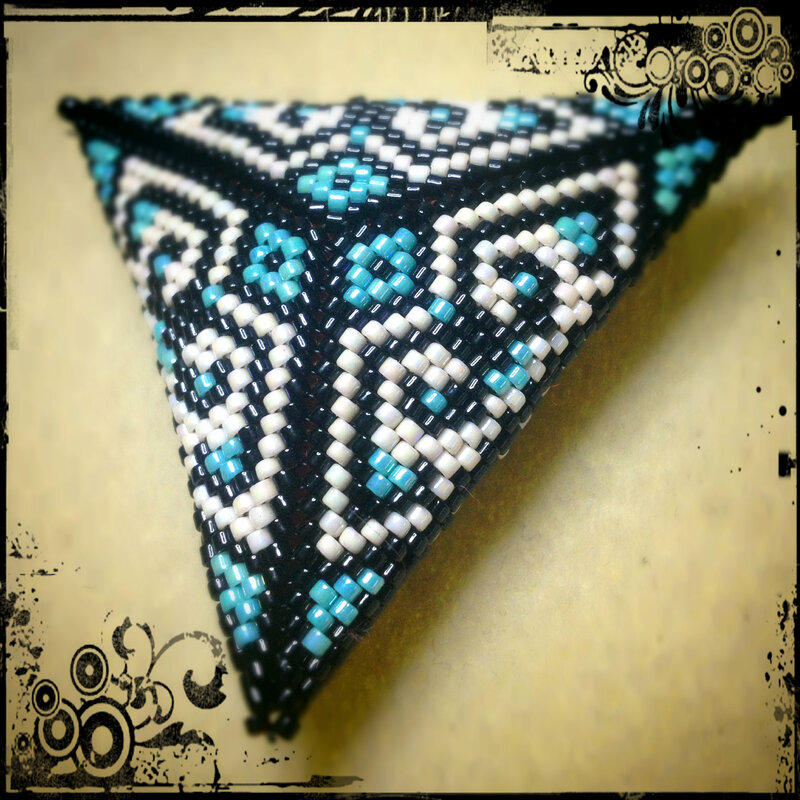 Native beadwork began with natural materials such as seeds, wood and bone. Their most intricate work was quillwork where they wove together quills from porcupines or bird feathers. They didn’t start using seed beads until the Europeans brought them over for trade, but once they did glass beads quickly took over as a favorite method of embellishment over the much more labor intensive quill work. The best part is that Native American beadwork is still going strong! There are many artists out there today who are keeping their ancestral traditions alive. KQ Designs is where I found the delightful picture of a beautiful crown decked out in some stunning beadwork, posted above. You can find many more Native Artists on Etsy! One of the ones I found that makes some really amazing pieces is LJ Greywolf. Check out his shop on Etsy, you can tell he puts some love in each of his pieces. Beaded Willow makes some great chokers and her barrettes are dripping with beads! I love it! My great grandfather was a rural doctor in Oklahoma that worked partially for a reservation. Sometimes his patients couldn’t pay in cash, so they paid with some beautiful beadwork. My grandfather’s beloved childhood moccasins are beyond repair, but still maintain some of their beaded beauty. I am currently working on fixing a beaded basket that at some point during the years has begun to fall apart. The basket itself is still very well kept, though the string holding the beadwork on is broken in several places. It is beautiful, and well worth the effort. 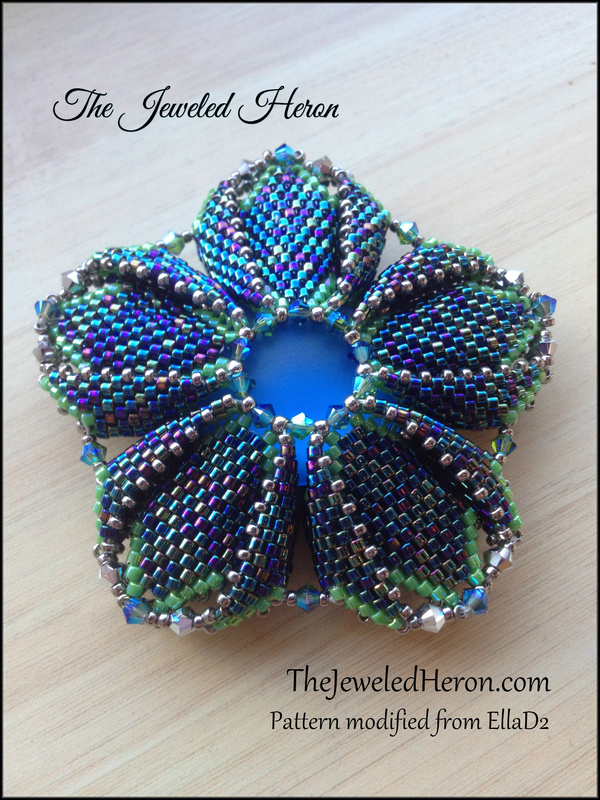 I just wish I had someone with more experience with the Native American style of beadwork to fix it. I feel like I’m throwing mud at a work of art! 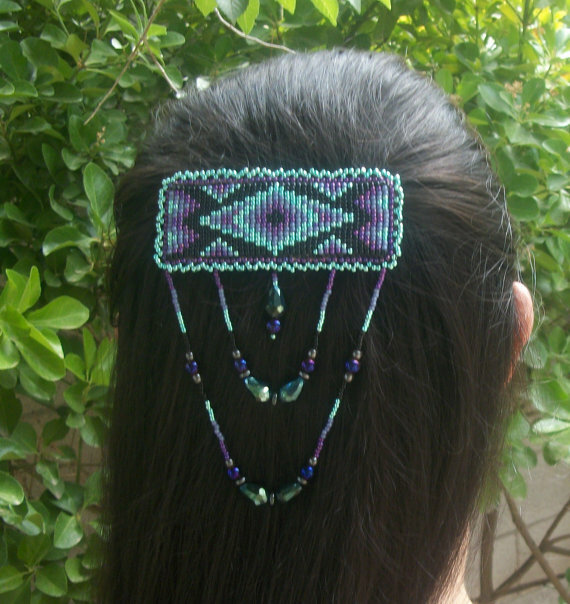 For more information on Native American beadwork check out this article from Fire Mountain Gems. Reading it today is what started my brain processing this blog post. Totally worth it! I have been working on a rather large project for the past few weeks and haven’t been able to give as much time to my beads as I would like to. I really need to make sure to set aside time each week to work on creating and designing jewelry, it really relaxes me and boy, oh boy, can I use some relaxation now. Jewelry creation has been a passion of mine for years, and it keeps getting interrupted by all the other things I need to do in life! Luckily, I am blessed by a supportive husband who loves me and wants to see me succeed, so that helps. He helps me overcome my anxiety and frustration and for that I can’t thank him enough. Even with life exploding all over my creative time, I have been able to create a new piece for stock and wanted to share them with you lovely folks. In the next few days I am hoping to have this bracelet and all the other new pieces in the store so folks can purchase them if they like them. The first piece is a lovely bracelet that would be perfect for someone with slightly smaller wrists. I can fit it on my wrists but it’s a wee bit tight. 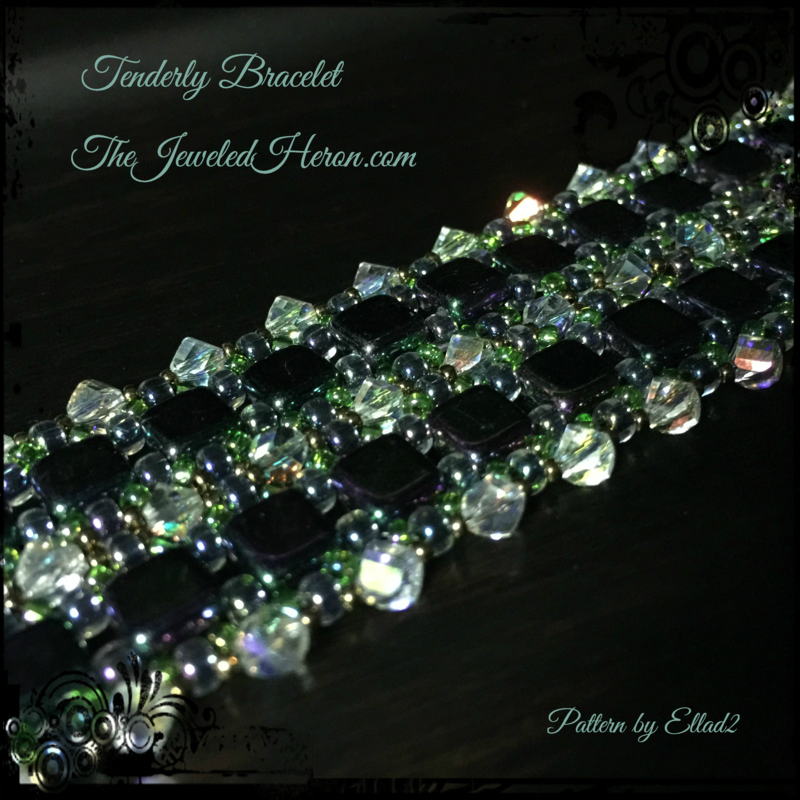 Swarovski crystal makes this bracelet sparkle! It was created by me, the pattern is by Ellad2. I have a bracelet on the workbench now too! I should have it finished in the next few days. Here is a sneak peek. I’m working it in purples as that is my second favorite color! I have so many ideas for my own patterns, and I am thinking of uploading a few of my own patterns for download here on the blog, what do you think? Would you like some simple patterns to download? I have a few I made for several classes I taught last year. Might be fun to see what you guys can make out of them! Last but not least, something totally not bead related! For years I have wanted to add a bit of color to my hair. I used to dye it bright red. But I’m already a bit red in the face so it wasn’t exactly flattering. I wanted something that would take the rosy cheeks and tone them down a bit. 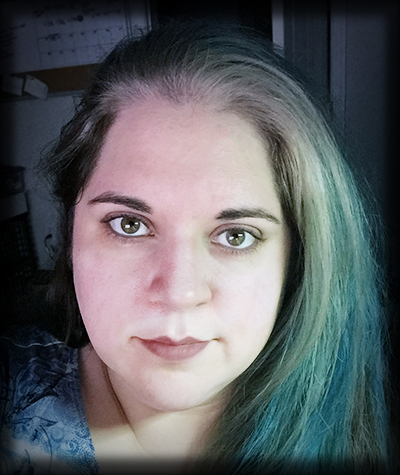 So I found a lovely hair stylist and she gave me a few streaks of blue! It’s such a great color of blue too, I absolutely love it. She also added a lighter patch in front, where all my grey is because I love the stripe of white! If it wasn’t such a pain to grow out I would leave that part natural and wear it with pride! Since I have no patience to let the color grow out, I figured this was the next best thing. How has winter been for you? We have had a massive amount of snow here and I for one will be glad when it gets warm enough that I can open up the windows and air out the house. Not to mention seeing the grass again! I am so used to spending at least one weekend a month out in nature, camping or hiking. Something where we can get out and stretch our legs a bit. Sadly we have been so sick the last two months that we have had to skip our nature weekends! I miss it terribly! I would love to get back out into the wilds and breathe deep. It’s so relaxing. Despite the wave of illness that has kept me from heading outside, I have been able to work on several crafty things lately. If I can’t get outside, I might as well make the most of the time I spend inside! I figured I would share a few of the projects with you to let you know I am still alive and kicking. 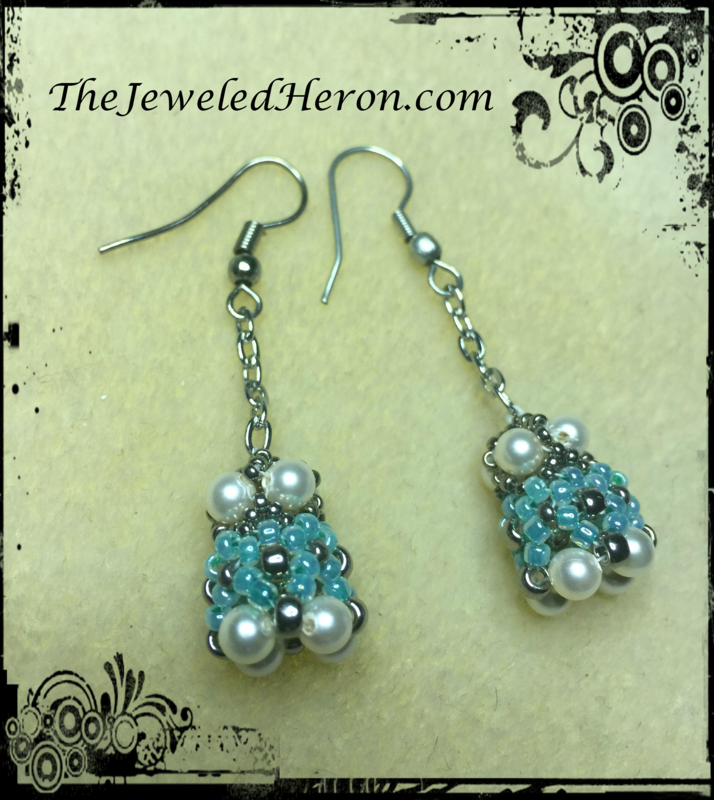 Life has been super busy here at The Jeweled Heron and once the sun returns I will take pictures of my new creations and post them in the store! As always if you see something you like, let me know. Seeing as how I love lists, (Big shock coming from the girl who likes to organize her beads eh?) I am going to organize my thoughts into a nice list for you all. Welp! That is everything for now! I hope you folks have a great and crafty weekend! Because I make everything by hand you can order any of the pendants in my store in any color combination you choose! 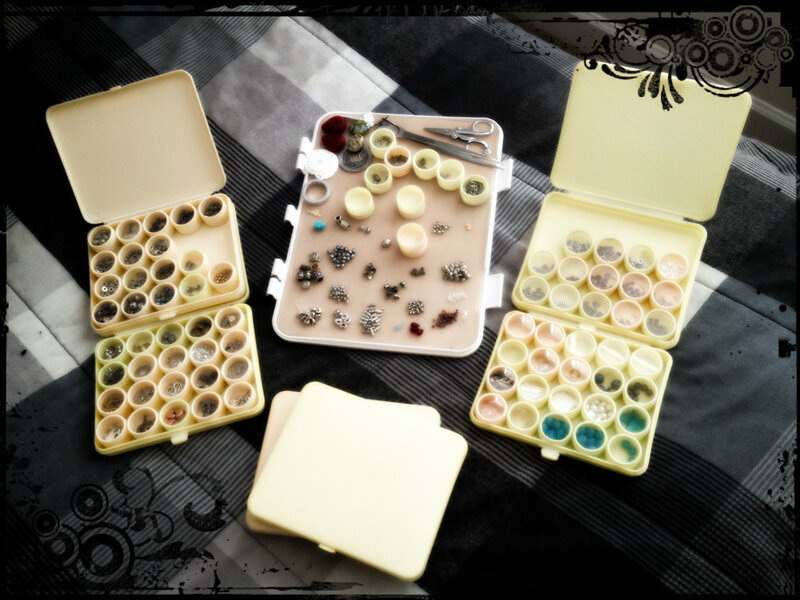 If you have a particular outfit that needs that perfect embellishment I can make sure that the colors are perfect! Feel free to drop me a line if you are interesting in discussing one to match your wardrobe! Also, because I love you guys, here is a sneak peek at the new pendant style that is coming soon! 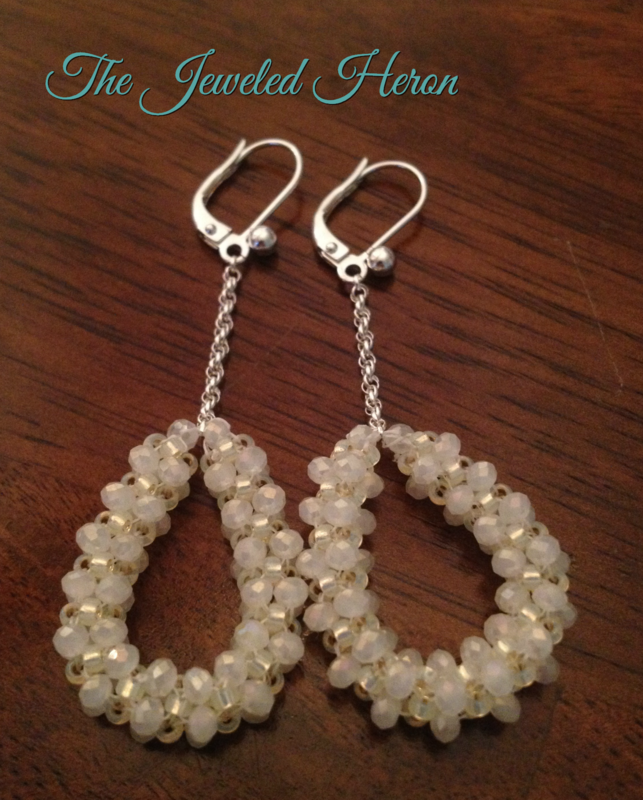 Working on Cute New Earrings! Life has been crazy here! Between settling into a new job, getting ready for the wedding and getting ready to move life has been busy, busy, busy! Still, I am still finding time to make beautiful things! I need to take pictures of all my earrings for sale but the storms recently have kept the sun out of sight which makes for very dark and uninspired pictures. Hopefully in the next few days I’ll be able to get some good photos and upload them to the webpage. Until then, here is a teaser of what is coming! I loved making these guys. Fun, lightweight and super sparkly! Finally finished EllaD2’s Morning Glory Pattern. The petals were a little unstable when completed so I added a few crystals to keep it from wobbling when worn. I love the extra sparkle! This pattern was definitely easier the second time around but it still takes a whole lot of time to complete. 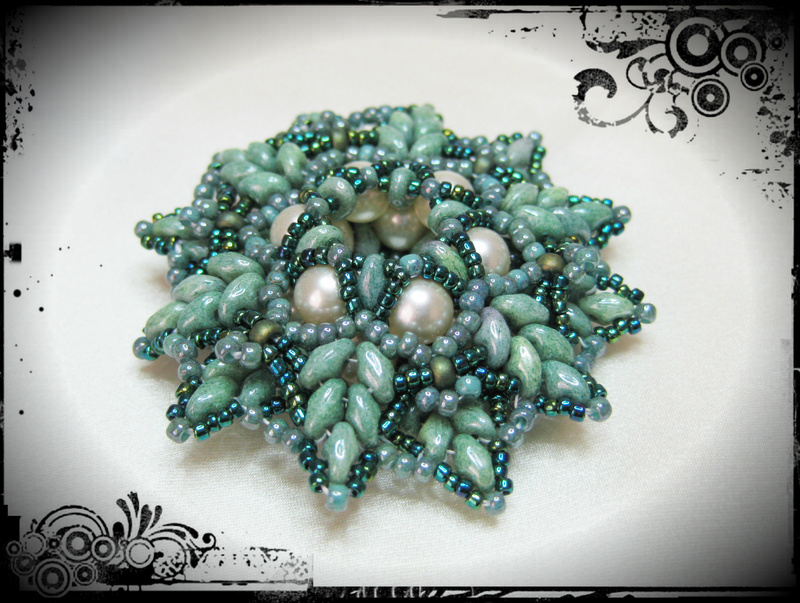 This piece can be made into a necklace or if you prefer, a brooch or hairpin! I should have it up on the webpage soon!